issuing the call for Nominations for the National Volunteer Award in 2018. To recognise the important contributions made in various fields. in any field, such as social, humanitarian, health, ecological, cultural, education, sports, etc. The voluntary work must have had a positive contribution towards a particular field and should ideally have served as an inspiration to others. The Youth Volunteer Award shall be awarded to a Volunteer between the age of 16 and 30 years. This award shall have the same aims as the National Volunteer Award and has the main scope to promote volunteering amongst young people. The Volunteer Organisation Award shall be awarded to a Voluntary Organisation who has been outstanding in the sector in which it operates, being both innovative in its approach and services within the community as well as in its way of recruiting and supporting volunteers. The Corporate Volunteering Award shall be awarded to that Company or Organisation coming from the Private Sector which has given tangible support to the Voluntary Sector, both by direct support as well as by supporting and facilitating its employees to volunteer. The volunteer must declare that he/she does not make any financial gains through the work done for the organisation. The Voluntary Organisation Award shall be awarded to a Voluntary Organisation who has been outstanding in the sector in which it operates, being both innovative in its approach and services within the community as well as in its way of recruiting and supporting volunteers. The Voluntary Organisation must be enrolled with the Commissioner for Voluntary Organisations and must have been in operation for the last two calendar years. The Voluntary Organisation should also be compliant with the Voluntary Organisations Act 2007 and its subsidiary legislation with regards to its annual returns and accounts. The Volunary Organisation may work in any field, such as sports, social, humanitarian, ecological, cultural etc., and must be in accordance with the human rights and laws of Malta. The voluntary work must have had some positive contribution towards a particular field and should ideally have served as an inspiration to others. 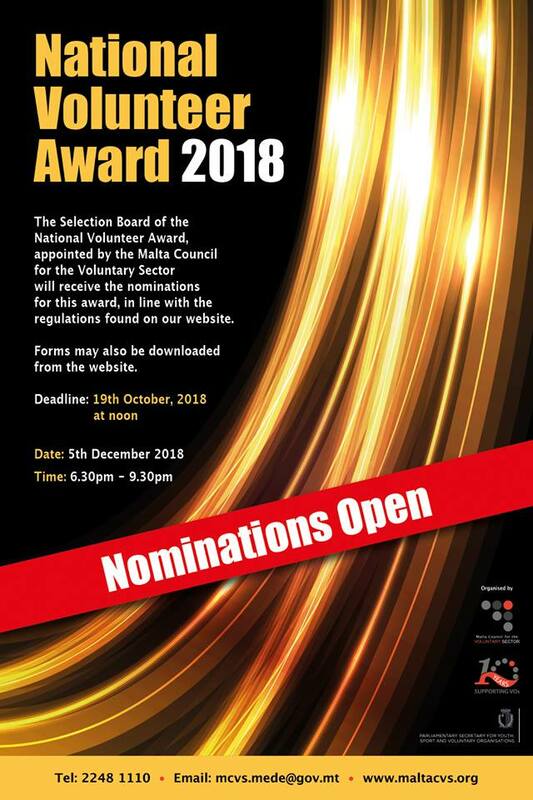 The Malta Council for the Voluntary Sector reserves the right to refuse nominations on ethical grounds. The Voluntary Organisation does not charge it’s service users for any services rendered or if this is the case it declares that there is no profit made out of these charges. Nominees for the Youth Volunteer Award must be between 16 years and 30 years old by the closing date for nominations. Nominees must declare that he/she does not make any financial gains through the work done for the organisation. The voluntary work may be in any field, such as sports, social, humanitarian, ecological, cultural etc., but must be in accordance with the human rights and laws of Malta. Nominated Companies must be a Company or Organisation coming from the Private Sector which has given tangible support to the Voluntary Sector, both by direct support as well as by supporting and facilitating its employees to volunteer. The Company did not make any financial gains or recieve external funds (ex. EU Funding) to support the volunteer/volunteering activity nominated for this award. The closing date for the nominations shall be the Friday the 19th October 2018 at noon.